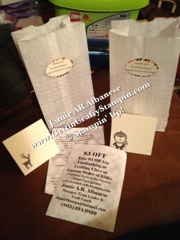 Getting Crafty with Jamie: Rewards for Giving Back! 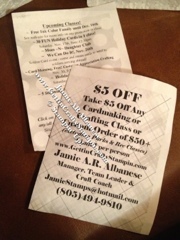 These were in the fun lil Thank You bags for all who donated or participated in the EARTHS Families Gives Back. Not a ton but a sweet lil bonus for those amazing Heros who gave to others in need! 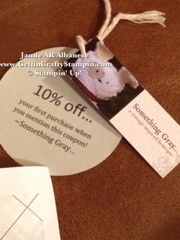 Lorin w/Something Grey donated discounts, thanks Lorin! 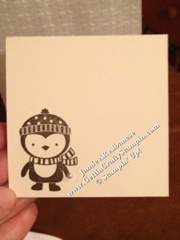 Principle Boone donated EARTHS Pencils and I created some cute 3"x3" cards as well as a quick My Digital Studio discount offer to any of my classes or a custom order. I love that these little gift backs made an impression w/the impression of different textures due to the Big Shot and our embossing folders. I like these fun two cards, the pearl is a fun Snowball in the penguin's hand from the No Peaking stamp set in our Holiday mini. 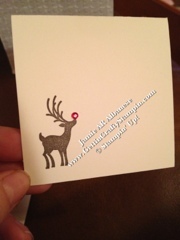 I adore this reindeer from Joyous Celebrations and how a red sharpie marker can change our Adhesive Backed Jewels! 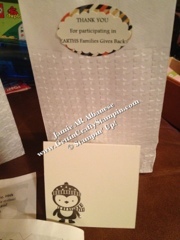 Ok I hope your day is sweetened with this Thank You Goodie Bag!